A person and his/her male ancestors bearing the same family name with their spouses. 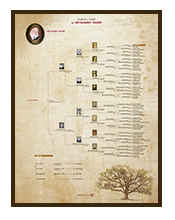 Ideal to show the direct link to the family first ancestor. 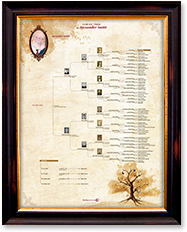 Contains up to 30 ancestors. A person and his/her male ancestors bearing the same family name of his/her mother, with their spouses. 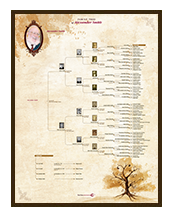 Ideal to show the direct link to the first ancestor of the mother?s family. 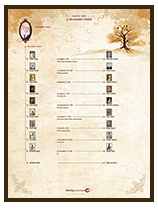 Contains up to 30 ancestors. 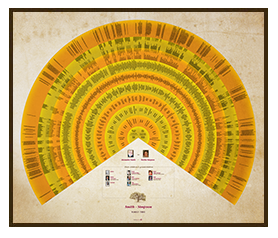 A person and his/her ancestry for 7 generations. Includes also the paternal line (male ancestors bearing the same family name, with their spouses, for up to 12 generations). 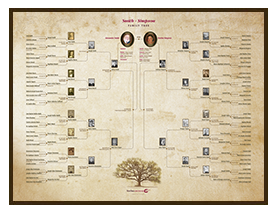 Ideal to show one person?s ancestry and the direct link to his/her first ancestor of the family. 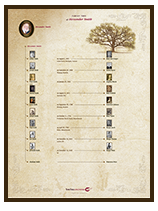 Contains up to 136 ancestors. 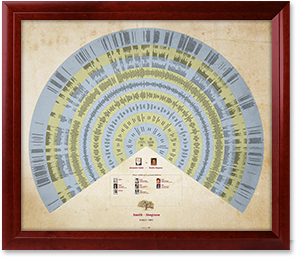 A couple, their children and their ancestry, covering a span of 7 generations. 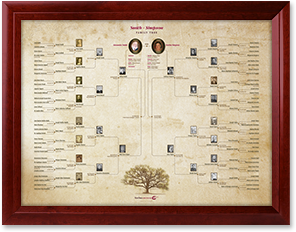 Ideal to show the close family, children or brothers & sisters, the ancestry of the couple,and the direct link with the first ancestor of every family.Contains up to 148 ancestors. A couple, their children, grandchildren, and ancestry, for a grand total of 10 to 13 generations. 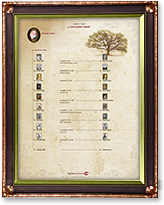 Ideal to show the immediate family, children, grandchildren and the family ancestry. 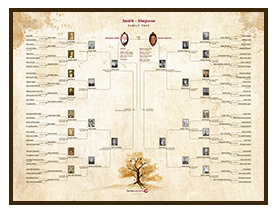 Contains up to 4 092 ancestors with their place and date of marriage.